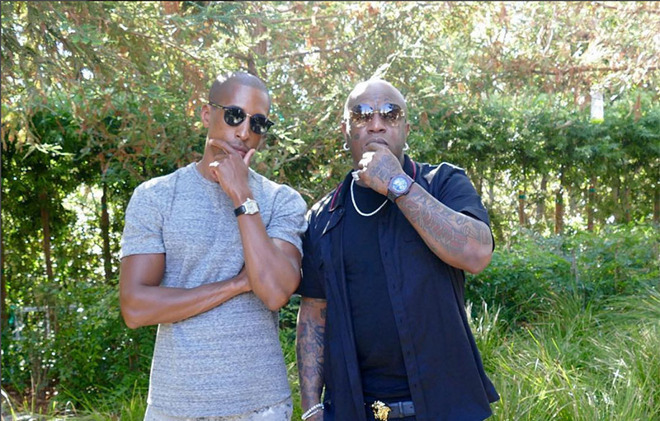 Apple Music content chief Larry Jackson (left) poses with Cash Money Records co-founder Birdman. Cash Money co-founder Bryan Williams, better known by his nom de guerre "Birdman," and Apple Music content chief Larry Jackson confirmed the the tie-up by posing together in a photo posed to their respective Instagram accounts on Sunday, reports Music Business Worldwide. "Welcome to the fam @birdman5star. Tough negotiator. Much respeck," Jackson said. Birdman initially thanked Jackson in his post, but later updated the text with a link to Music Business Worldwide's report. Terms of Apple Music's latest deal are unknown, though the streaming service is expected to gain exclusive access to fresh content from the artists in Cash Money's stable. Apple is no stranger to striking exclusive deals with artists, including Cash Money's Drake, but a partnership with an entire record label is rare in the streaming industry. Streaming music services often compete on content, as many offer largely similar media libraries. The nature of the business has placed a premium on access so-called "windowed exclusives," or content that remains exclusive to one service for periods ranging from weeks to months. A latecomer to the streaming game, Apple has aggressively sought out first rights to new releases from chart-topping artists. The effort led by Jackson has been fruitful, as Apple inked deals with Chance the Rapper, Drake, Eminem, Future, Pharrell, the 1975 and more. Most recently, Apple Music landed Britney Spears' new effort "Glory," set to debut later this month. Update: According to sources close to the deal, Apple has agreed to fund a documentary with Cash Money Records, not secure exclusive content from the label's lineup of artists, reports Bloomberg. Along with windowed exclusives, Apple has attracted big-name acts by fashioning Apple Music as a "clubhouse" for artists. Collaborative music videos and films are one facet of the strategy, though Bloomberg suggests the Cash Money deal has more to do with original content for Apple TV than music streaming. Apple is currently developing a show focusing on the app business called "Planet of the Apps." Actress Gwyneth Paltrow, musician will.i.am and entrepreneur Gary Vaynerchuk are attached to the project.